Abdel Fattah Al Sisi, President of Egypt, said Egyptians had made history in the past two years, first revolting against corruption and despotism to claim their right to freedom, dignity and social justice, and then refusing to succumb to the tyranny of a faction that in the name of religion had put its narrow interests before those of the people, seeking to undermine the democratic process and national institutions. Egypt had warned about the aims of extremist groups that were transforming the Jewish, Christian and Muslim values of justice, compassion and mercy into grim sectarianism and destructive civil and regional wars. Since his election as President, Mr. Al Sisi said he had sought to build a civil democratic State by adhering to a road map for the future agreed upon by national power, which would be completed with the holding of parliamentary elections. “Our aim is to build a ‘New Egypt’ […] A State that respects the rights and freedoms, honours its duties, and ensures the co-existence of its citizens without exclusion or discrimination,” he said. That State should also respect and enforce the rule of law, guarantee freedom of speech and religion, and work towards growth, prosperity and a promising future for all Egyptians. To attain that, the Government began implementing an ambitious programme to spur development and build the foundation for a free-market, investor-friendly economy by 2030. The New Suez Canal Project was proof of the New Egypt’s resolve to forge a better future for its children. He invited everyone to participate in the conference on national and regional economic development in Egypt next February. Such steps reflected the social contract, in Egypt’s new Constitution, to build a State with strong institutions, governed by the rule of law and the principle of separation of powers, and one not held back by terrorism, he said. Egypt had suffered from the scourge of terrorism since the 1920s. It was vital not to allow the handful of extremists committing atrocities in the name of religion to abuse Islam and offend the 1.5 billion Muslims that cherished its noble values. Everyone must intensify cooperation and coordination to end support for such terrorist organizations. The crises facing the region from terrorism could be resolved by applying the principles of equality for all citizens and respect for the rule of law, and by decisively confronting extremist forces. Egypt had partnered with Libya’s neighbours on an initiative to end terrorism and bloodshed in Libya, help strengthen elected Libyan institutions and preserve territorial integrity, he said. To succeed, the smuggling of arms into Libya must stop. Turning to Syria, he said it was possible to put into place a political framework that fulfilled the Syrian peoples’ aspirations without compromising with terrorists or replicating the situation against which they initially rebelled. He stressed Egypt’s support towards that end. On Iraq, he said the formation of a new Government was a “significant development” that restored hope for achieving stability, regaining areas currently under ISIS’ control, maintaining Iraq’s territorial integrity, and ending the bloodshed. The Palestinian issue remained a top priority for Egypt, he said. The Palestinians’ aspiration to establish an independent State with East Jerusalem as its capital, based on the peace process, was not to be negotiated, as that would erode the basis for comprehensive peace in the region. National security in other Arab nations was an integral part of Egypt’s own national security. His country’s vision of international relations was founded on respect for international law and mutual respect. 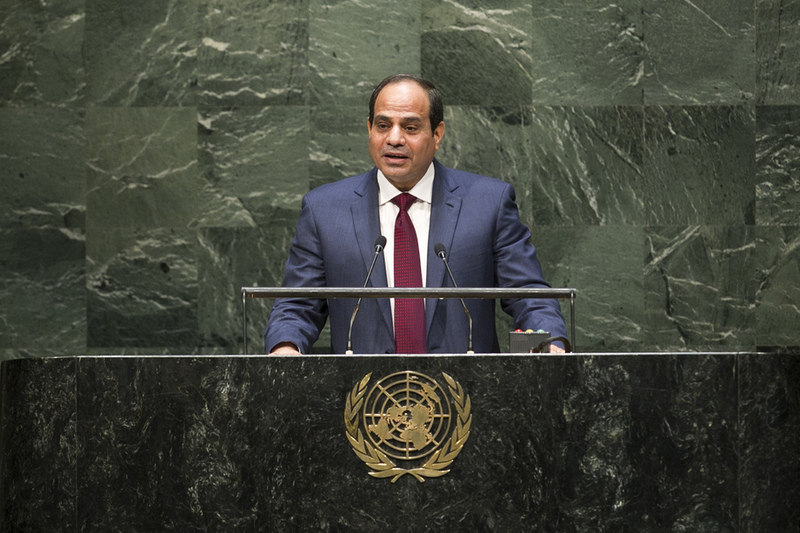 Egypt’s aspirations to become a non-permanent Security Council member during the 2016-2017 period stemmed from its desire to achieve the Organization’s aims and protect the interests of developing countries, particularly in Africa. He invited Member States to support its candidacy.